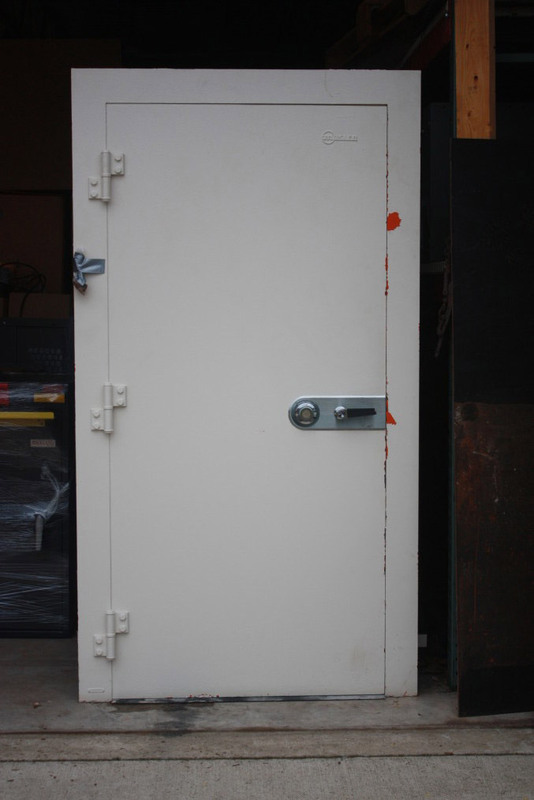 Finding a used vault door that fits your needs may be a challenge, but if you get lucky, you might find something cool for a reasonable price. Learn more about the different types of used vault doors below. Most people are familiar with the big stainless steel doors they see on their banks’ cash vaults or safe deposit rooms. Doors of this type usually weigh from 3000 to 5000 pounds, and the frames are built securely into the walls. We get calls every week from contractors who are remodeling branch bank buildings. They want to sell us the vault door or even give it to us, all we need to do is remove it. Jewelry stores and businesses that work with high value materials or controlled substances are other users of high security vault doors. Because of the weight and difficulty of removing high security vault doors, most often they are left in place or they get scrapped. Consumers occasionally call to buy one of these, but always change their minds when we talk about cost. Many banks also have fire rated vault doors that consumers never see. Separate vault rooms for document storage were common features when paper signature cards, mortgage documents, etc. had to be stored in fire-safe environments. Local governments use them on rooms where real estate records are kept. Fire rated vault doors are also common in older churches, schools and armories. These doors are much easier to remove and re-use than the stainless units. Because very few fire rated doors are being produced now-a-days, these used vault doors are cost effective alternatives when someone wants fire protection on a vault room. They usually need to be re-painted, like the Mosler unit pictured, but sell quickly when we have them in stock. Antique vault doors usually have plate steel fronts from ¼” to 1” thick, but no fire protection. They were used in all kinds of places — banks, factory tool cribs, fur storage vaults, churches, etc. Some have interesting original graphics on the fronts. Often the bolt works on the inside are exposed so you can see all of the parts. Many of these have (or had) an interior “day gate” door made of vertical or horizontal bars. Because of the inner gate and because building walls were frequently quite thick, many of these vault doors have thresholds that were around 16” deep. On very rare occasions a heavy duty, hundred year old antique vault door from a bank turns up, with original paint and graphics. They are difficult to get out and are expensive. Something we could sell every single day is a used modern vault door made by someone like Fort Knox, American Security or Golden Spike. These are made primarily for residential construction. Modern used vault doors almost never become available because there is seldom a good reason to remove one from a home. Finding a used vault door might be difficult. If you live within a few hours of Grand Rapids, Michigan come to Hoogerhyde Safe or call us. We may have what you want, or be able to find it. Sorry, we do not ship used vault doors.